The misguided obsession with smart sanctions. Current U.S. policy toward Iran could be boiled down to a tweet: If you haven’t sanctioned the Islamic regime enough in the past, sanction it some more. Congress is in the final stages of passing a law designed to penalize foreign companies doing business in Iran. In February, the Treasury Department expanded the list of Iranian firms subject to financial sanctions. Obama has dispatched envoys to line up support from U.N. Security Council members for yet further strictures. Whatever sanctions get imposed, rest assured they won’t be stupid ones. In recent years, policymakers have grown enamored with “smart sanctions”—measures like asset freezes, financial restrictions, travel bans, and arms embargoes—designed to hurt the targeted regime and its key supporters without imposing the severe hardships on the sanctioned country’s mass public that come with a full embargo. Ostensibly, targeted sanctions are the precision-guided munitions of economic statecraft. By squeezing powerful elites, the argument runs, these supporters will eventually pressure the government to change. With Iran, any multilateral economic sanctions are guaranteed to be of the smart variety, aimed specifically at the Iranian Revolutionary Guard Corps (IRGC)—an elite coterie loyal to President Mahmoud Ahmadinejad that has assumed control over the nation’s economic and security apparatus. What’s more, Russia and China have stated that new sanctions should only target Iran’s ability to develop ballistic missiles or nuclear weapons. Despite all the current enthusiasm for smart sanctions, we now have a pretty good sense of their efficacy. And, for all their political virtues, they are far from a magic bullet. Unfortunately, there’s no sanctions policy that can guarantee that Iran won’t get the bomb. But, if sanctions are going to have a chance at success, the evidence suggests they will have to be significantly less smart. Interest in alternatives to comprehensive sanctions began to spike. Until the mid-’90s, the general consensus among policymakers on sanctions was simple: The greater the economic costs imposed on the targeted country, the more likely the targeted government would concede. Advocates of smart sanctions suggested a more nuanced approach. Gross economic damage was not what mattered—it was whether the target government and its key domestic constituencies felt significant political and economic pain. Targeted sanctions seemed the perfect policy compromise between Security Council members frustrated by the Iraq episode (Russia, China, and France) and those who wanted to preserve sanctions as a policy tool (the United States and Britain). The name also helped—as one British official told me, “smart sanctions” sounded a lot better than the alternative. There’s just one little problem: It’s not at all clear that smart sanctions work any better than comprehensive sanctions in forcing a country to alter objectionable policies. Indeed, the best available evidence shows the opposite. Most statistical analyses of sanctions find that the greater the aggregate economic costs imposed on the target government, the more likely that the sanctions will lead to policy changes. David Cortright and George López, co-editors of Smart Sanctions, noted back in 2002 that “the obvious conclusion is that comprehensive sanctions are more effective than targeted or selective measures. Where economic and social impacts have been greatest, political effects have also been most significant.” At an International Studies Association panel earlier this year, even academic architects and boosters of the smart sanctions approach like Thomas Biersteker and Peter Wallensteen conceded that, compared to comprehensive sanctions, the policy results had been mixed at best. Smart sanctions rest on a reasonable theory; so why don’t they work better? It is worth remembering that targeted sanctions were designed in response to the perceived failure in Iraq, an extreme outlier case. One implicit assumption behind smart sanctions is that they will be long-lasting—but, historically, most sanctions are imposed for less than a year. Sanctions that are expected to be imposed for a long time should function like a containment strategy; those intended to elicit a policy change ought to be costlier, but quicker. Another assumption is that a sanctioned population will rally around the flag rather than pressure the recalcitrant regime. But political scientists have found that costly sanctions reduce a government’s staying power. If a target government has limited ability or willingness to repress its own people, comprehensive sanctions can mobilize the more apathetic swaths of the citizenry, leading to coups and uprisings. The reason that Saddam Hussein agreed to the oil-for-food program in the first place was because, by the mid-’90s, the sanctions were leading to rising levels of domestic unrest. Press reports indicate that Russia’s recent increase of fuel prices in Kyrgyzstan triggered the mass protests that led to regime change there. Clearly, targeted sanctions have their uses. Smart sanctions can prod modest policy changes like, say, forcing a country to crack down on money laundering. But, when it comes to altering policies vital to national security—like a nuclear program—smart sanctions are pretty much a dud. The most high-profile success is Libya—but that episode also shows the limits of targeted sanctions. A welter of different policy tools forced Libya to alter course, including back-channel negotiations, the Proliferation Security Initiative, and the unspoken threat of invasion after Operation Iraqi Freedom. It was only the combination of these policies—plus the erratic nature of Muammar Qaddafi—that did the trick. Iran is a tough test for sanctions. After all, financial sanctions have already exacted a toll; one former Iranian official admitted in late 2008 that U.N. sanctions had increased the price of imports anywhere from 10 percent to 30 percent. Or, as Saeed Jalili, Iran’s lead negotiator on the nuclear issue, bragged to Der Spiegel: “[D]o you really believe there are sanctions that can hit us that hard? We’ve lived with sanctions for thirty years, and they can’t bring a great nation like Iran to its knees. They do not frighten us. Quite the opposite—we welcome new sanctions.” While this is bluster, it’s true that sanctions have accelerated the IRGC’s takeover of key sectors of the economy. Imposing more comprehensive sanctions would carry obvious risks. With Russian and Chinese opposition to any program including gasoline sanctions, its implementation would be partial at best. The Iranian population might very well rally to the regime, given the evident national pride in the country’s nuclear accomplishments. And, if the regime does not budge, the Iranian people will suffer more—and the United States will likely be blamed. Still, the greatest weakness of the regime has been the economy. Despite an unprecedented oil boom, corruption and macroeconomic mismanagement have produced sclerosis. Iran’s inflation rate skyrocketed in 2009 and is still over 10 percent. According to Foreign Policy’s Failed State Index, the income of Iran’s top 20 percent rose more than four times as fast as that of the bottom quintile between 2005-2007. The government is concerned about the popular backlash that will come from its plan to phase out more than $40 billion in consumer subsidies. Iran’s regime is succeeding in making itself less dependent on foreign imports of gasoline, but more comprehensive sanctions that encompass the energy sector would raise the price of gasoline. Iran’s current regime is not as vulnerable as Kyrgyzstan’s, but higher consumer prices would test its hold on the country. For all of the regime’s radical rhetoric, its governing philosophy is ruthlessly pragmatic—survival über alles. If powerful sanctions threaten its grip on power, it will make concessions. There’s a reason that Defense Secretary Robert Gates wrote a memo in January calling for additional policy options—he is skeptical that smart sanctions alone will accomplish anything. In response, Obama administration officials have signaled that they see the newest round of smart sanctions creating what The Washington Post’s David Ignatius labeled a “sticky trap” for the leadership—that these measures are a way station on the road toward broader, more restrictive sanctions. 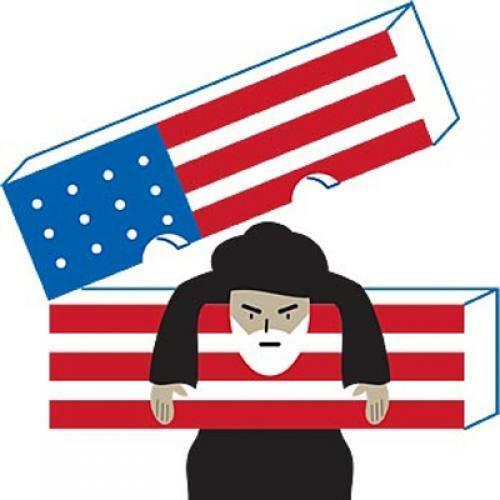 The idea is that, as Iran tries to create new ways around the existing sanctions regime, the United States and United Nations will simply add firms to the sanctions blacklist, expanding the scope of the measures. As Ignatius characterized it, “the harder the Iranians try to wriggle out of the sanctions, the more tightly they will be caught in the snare.” If this is indeed the policy, then it is an implicit concession that smart sanctions weren’t such a brilliant idea after all. Daniel W. Drezner is a professor of international politics at Tufts University’s Fletcher School of Law and Diplomacy. He is the author of The Sanctions Paradox: Economic Statecraft and International Relations.